I have a few demonstrators who signed up under me, and I have a 'group'. The name I selected is 'Hoot's Got Stamps?'. We meet once a month to discuss business and to get some feedback from me and the other ladies. December is a super busy month for all of us, so we moved our normal meeting from the 2nd Wednesday of the month, to the 1st Wednesday of the month. That's today! and we also through in our holiday party at the same time! 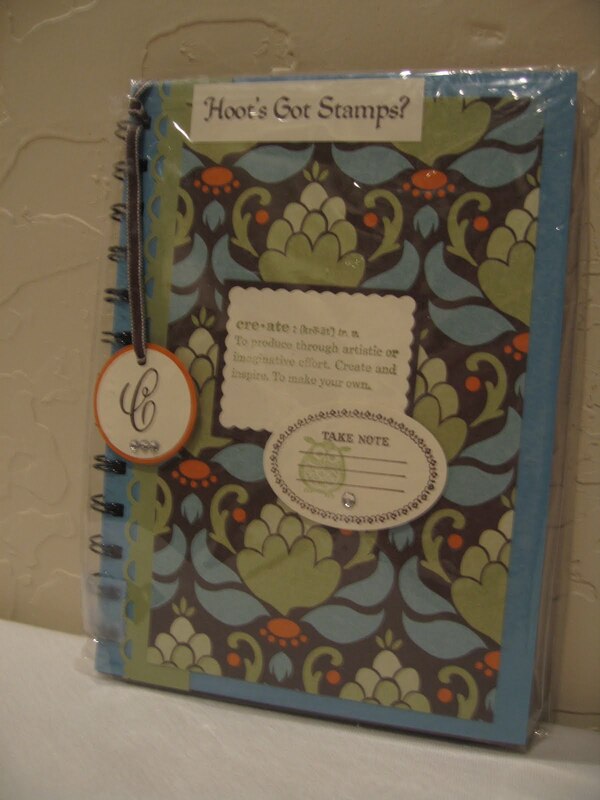 Here is one of the journals I altered for each of my ladies. I monogrammed each of them, to make this simple gift a little sweeter :) This one is for Caitlin W. The 'C' monogram also works as a book mark. Pretty clever, huh? Well, ok, I didn't invent that, but I remembered to add it. Doesn't that count for something? I used some Greenhouse Gala DSP, Marina Mist, Chocolate Chip, Very Vanilla, and Pear Pizzazz card stock. 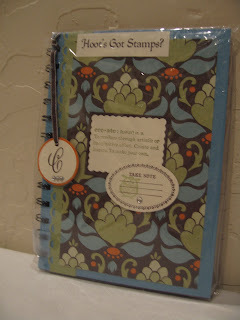 The 'create' stamp is from 'Define Your Life' stamp set, and the 'take note' is from 'Notable Ornate' stamp set. Sometimes, simple is just beautiful. Thank you for looking, and let me know what you think about their altered journal notebooks.